Babywearing is an art which, when practised correctly, will have profound benefits for you and your child. It is so much more than an alternative transportation method to prams and buggies, and there is so much more to it than buckling a baby into a harness. Like all traditional parenting skills, the art of babywearing is best passed on from from one experienced parent to another. But how? 1) Teach yourself. Teaching yourself can include following written or DVD instructions that come with your new sling; watching YouTube videos of babywearing demonstrations; joining online forums such as those at the babywearer or natural mamas for information and support from fellow parents. Teaching yourself has the advantage of being free, can be undertaken in your home at a time which suits you, and you can learn in your own time. The main disadvantage is being unsure whether you are using your sling safely and correctly. 2) Slingmeets. A slingmeet is a social meeting run by babywearing parents who get together to share their experiences of babywearing. 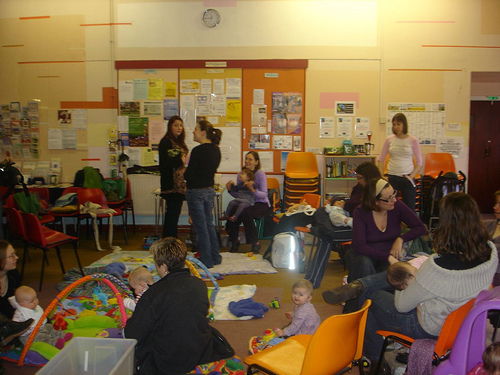 At a slingmeet you can see experienced parents using slings and you will often have the chance to try out different slings, or even borrow one if the group has its own library of slings to lend out. for a small donation to cover costs. Disadvantages are that slingmeets are often busy, which means you don’t get focused time to learn the skills in depth; because of the social nature of the meetings, there are often lots of small children running around, and meetings are often held in cafes or public spaces, which can be less than optimal conditions for learning a new skill properly. However, slingmeets are great places to get a flavour of babywearing, and to find social support and friendships once you feel confident in using slings. In the Greater Manchester area there are Manchester Slingmeet, Bolton Slingmeet and Glossop Slingmeet. Find your nearest one on Slingmeet website. 3)Babywearing Consultations. A babywearing consultation is a focused session with an experienced babywearing practitioner, who will work with you to find the sling that suits your needs, and help you to learn to use it with confidence, comfort and safety. In a consultation you will find out about the ways babywearing can benefit your baby’s physical and emotional development, and how correct carrying can support your own wellbeing. You will learn vital safety information, and have personal attention while you learn to use the sling yourself. You will often be able to borrow a sling, and will leave with full instructions, research-based information on safety, and access to follow-up help. The advantages of a babywearing consultation are in knowing that you will learn to use a sling correctly and safely, and to have focused attention to help you learn this skill. You will have access to well-researched information and have the time and space to practice under the supervision of a consultant. Often, consultants will travel to your home, or provide consultations in suitably-equipped premises. Consultants will provide high quality slings and demonstration dolls to use during the session. The disadvantages are that, unlike the other two methods, you pay for this service, and that there may not be babywearing consultants local to you. 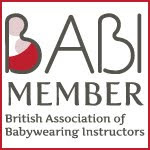 Find a consultant near you on British Association of Babywearing Instructors (BABI), Trageschule UK, School of Babywearing and Sling Guide.